Whilst the US equity market saw a marginal new low of sp'2039, the VIX was generally stuck.. settling +1.1% @ 16.87 (intra high 17.19). Near term outlook is for renewed equity upside into the weekly close, which will probably equate to VIX in the 15.25/14.50 zone. The big 20 threshold looks out of range... and VIX has probably maxed out today in the low 17s.. along with sp' flooring at 2039. US equities closed somewhat mixed, sp -3pts @ 2040 (intra low 2039). The two leaders - Trans/R2K, settled higher by 1.1% and 0.6% respectively. 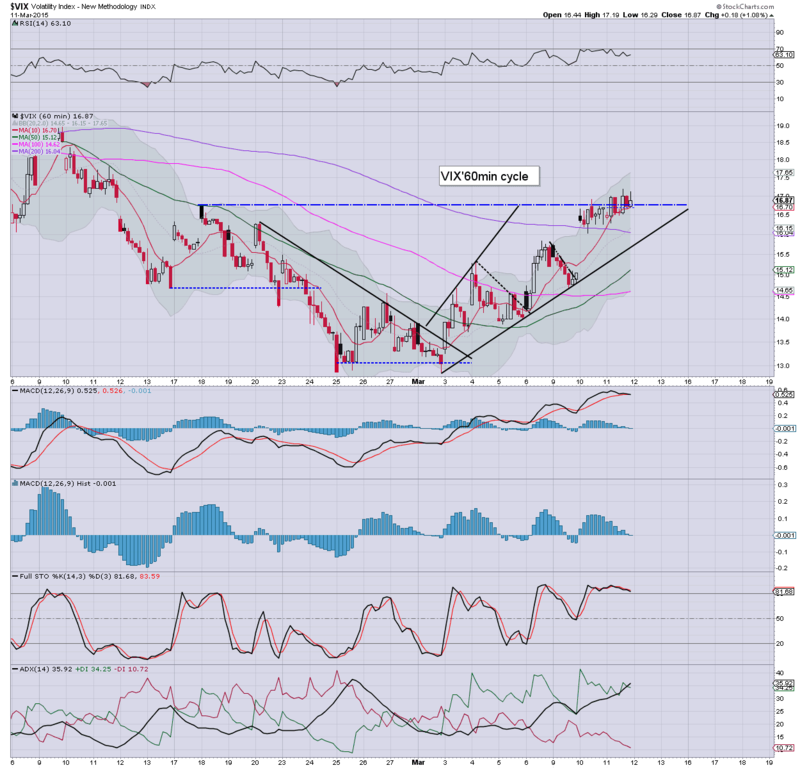 Near term outlook offers a rally to the sp'2070/80s within the next 2-3 trading days. *closing hour was surprisingly weak, with another fractionally lower low. Overall though, we're still due a rally in the near term. A rather tedious day, but one which does make for an initial turn day. Overall, the sp'2070/80s look a viable target level by the Friday close, before a retrace of some degree early next Mon/Tuesday. 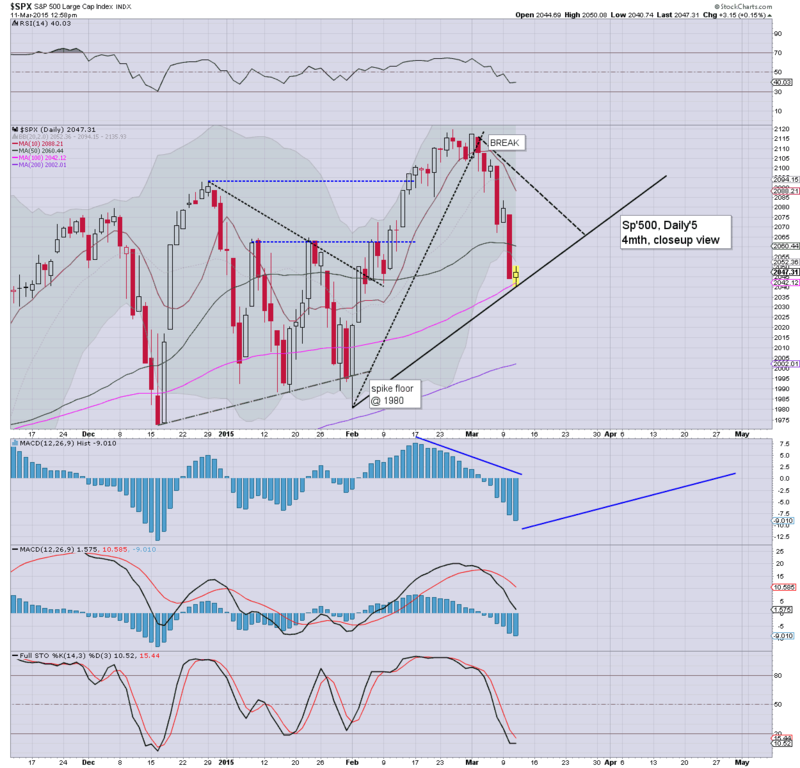 US equities look set for moderate net daily gains, with a viable daily close in the low sp'2050s. VIX looks set to close a touch red in the 16s. Metals remain broadly weak, Gold -$7, with Silver -1.5%. Oil remains weak, -0.7%. So... yes... we probably have a floor of sp'2040.. along with a VIX cycle high of 17.19. There is viable upside to the 2070/80s by the Friday close, although realise some would be highly dismissive of that scenario. 3.26pm Despite a touch of weakness to sp'2042... the R2K/Trans are not showing any problems... and it still bodes for upside into the weekend. 3.40pm.. 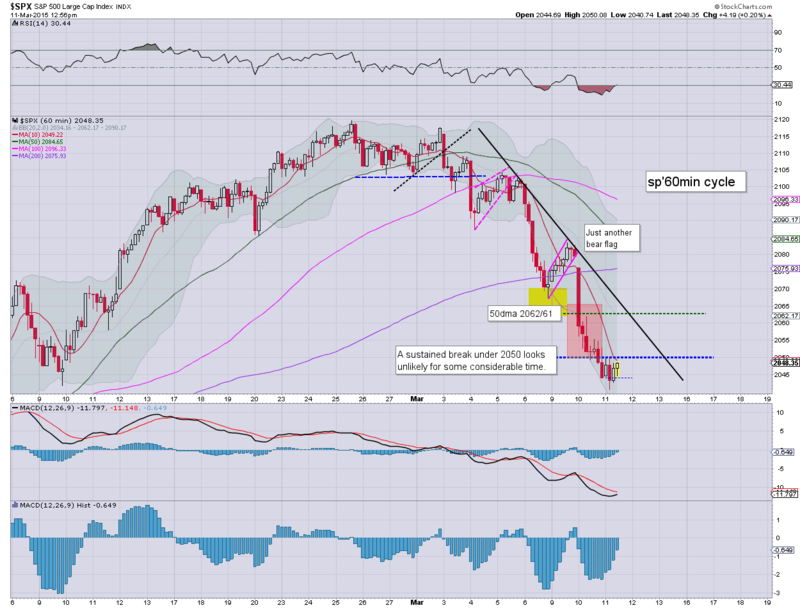 I realise some will be getting spooked right now, but really.. the Trans/R2K are NOT confirming the move. The VIX is a little higher...but remains relatively subdued. notable weakness, AAPL -1.6%... that is not helping the broader market. 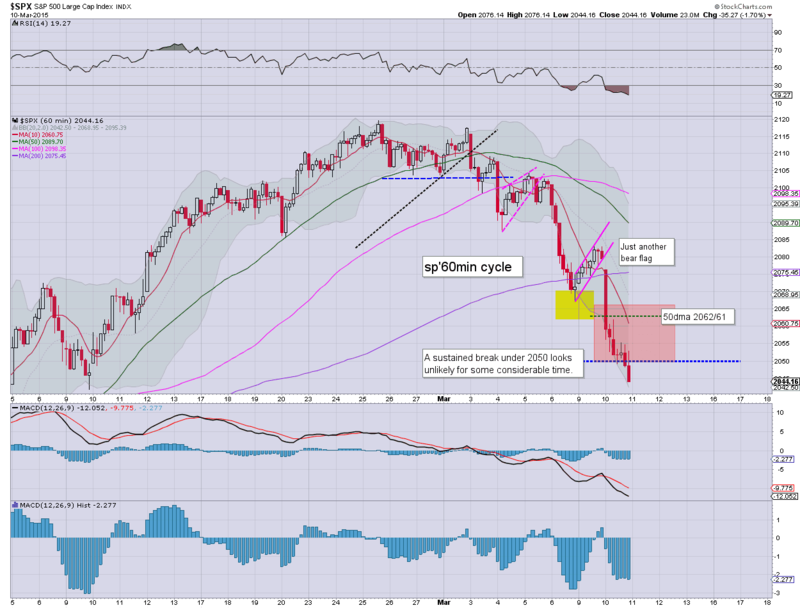 US equities are battling to hold the earlier low of sp'2040. There is notable significant strength in the Transports, +1.0%. Metals remain broadly weak, Gold -$9, with Silver -2.0%. Oil is similarly weak, -2.2%. *yesterday saw a notable break of rising trend in the Transports, and it remains the only key break the bears have achieved this year. VIX has just broken into the 17s.. which is ironic considering the minor chop in the main market. Not much to add.. on what is arguably a turn day. 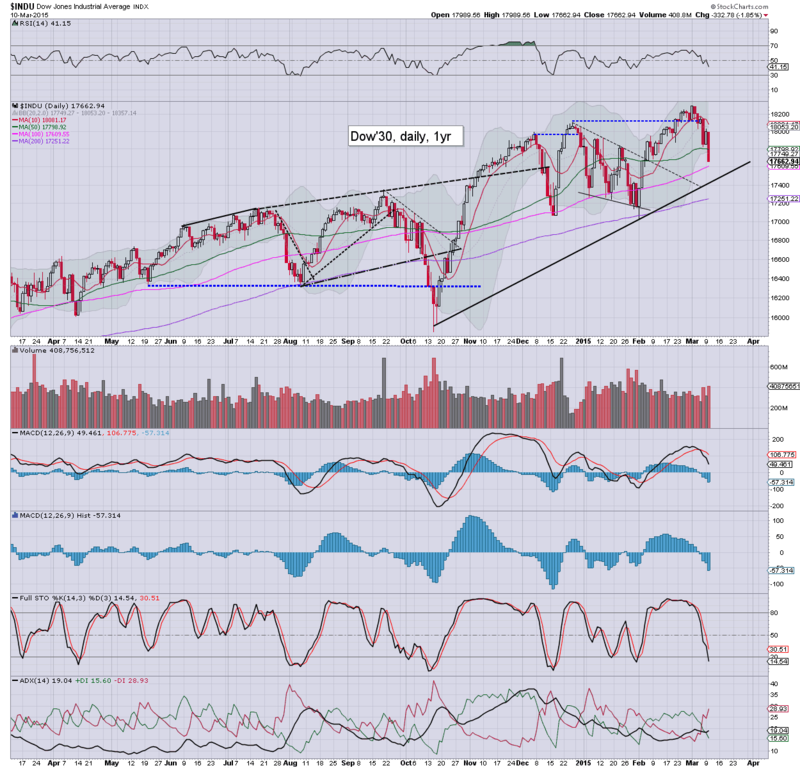 Yes.. we broke a lower low today of sp'2040, but really.. market looks exhausted on the downside. A bounce into the 2070/80s looks VERY probable.. and if we see a short-stop cascade.. then those levels are viable into the Friday close. Equities are in minor chop mode... ahead of what will probably be a move into the sp'2070/80s. as early as the Friday close. 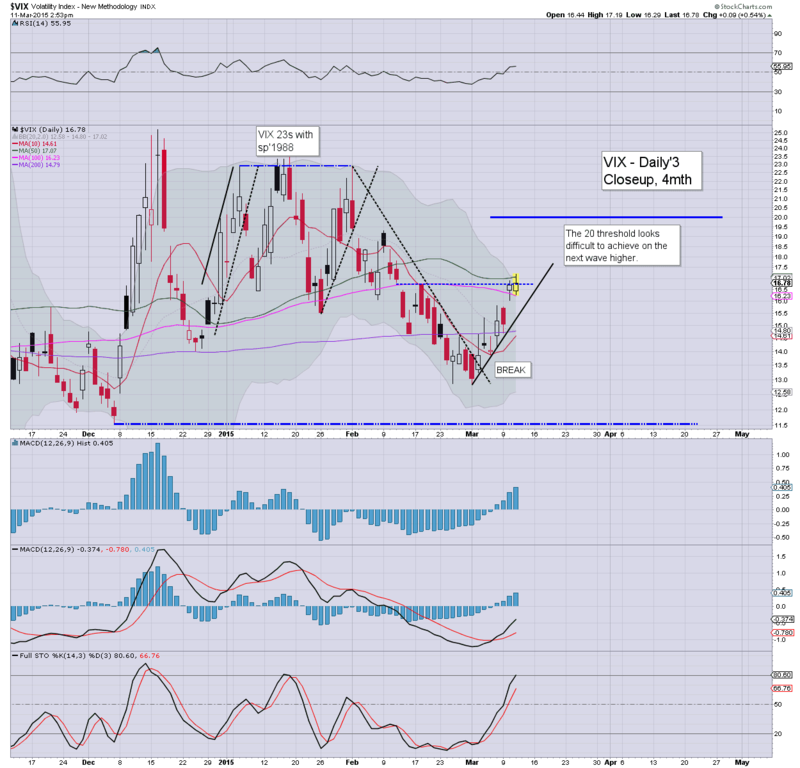 VIX remains similarly stuck.. although did fractionally break above the Tuesday high. Metals remain weak, Gold -$7, with Silver having broken a new multi-year low. *metals remain within a starkly bearish down trend... the strong dollar is not helping. So... minor gains... but a daily close in the 2050s remains very much within range. *Oil inventories came in much lower than last week at 4 million barrels, but its not enough to inspire the oil traders. 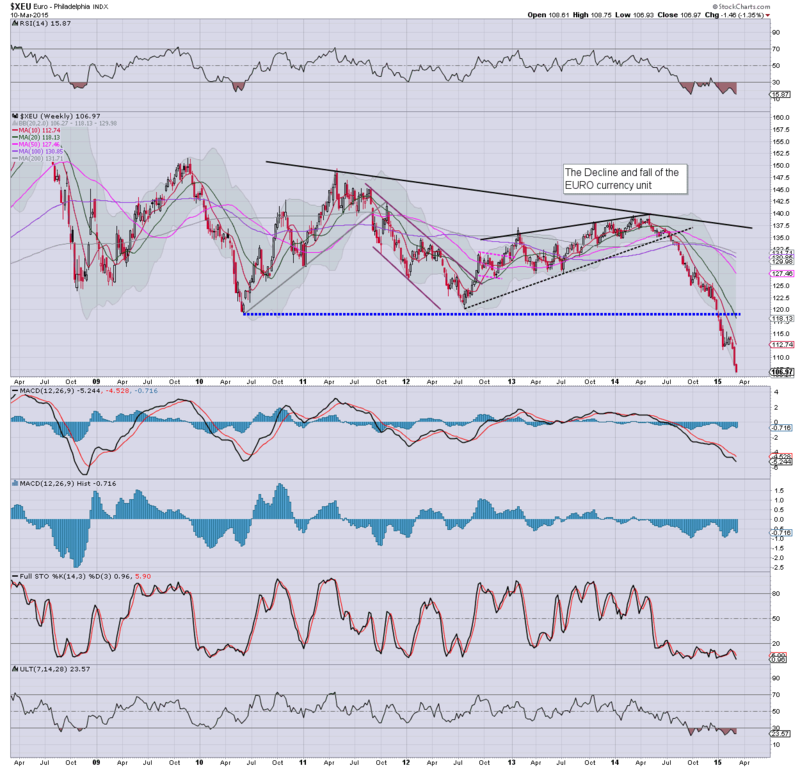 Further, the USD strength is a constant downward pressure... as it is for the precious metals. Price action is much stronger than yesterday (not least with stocks like INTC +3.6%), we appear to be seeing just a minor washout wave. Equity bulls merely need to retake the 2050s... opening up a break of the down trend for tomorrow. It is typical turn time of course... so.. lets see if the bull maniacs can push this back into the 2050/55 zone by 2pm... I'm guessing they will. 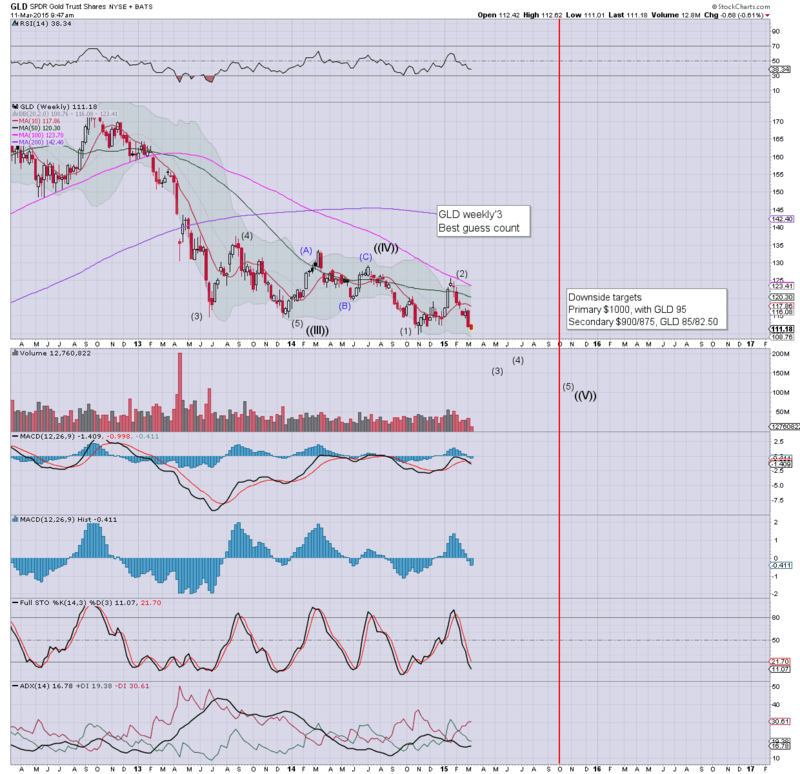 Metals continue to unravel... Gold -$12.... Silver breaks a new multi-year low. 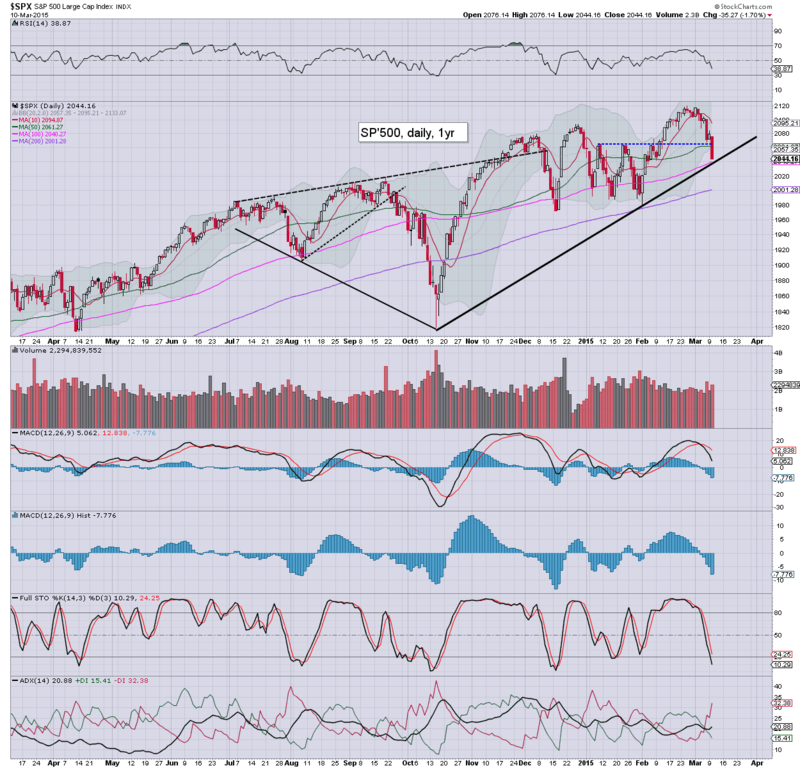 US equities open with some mixed chop, but equity bulls look set to see a bullish MACD cross before the end of today. A break of the down trend looks highly probable by midday Thursday. Metals are weak, Gold -$5... on its way to breaking a new multi-year low (<$1130). *the strong dollar sure isn't helping the metals. The above 'best guess' wave count for Gold looks on track. I'm broadly in agreement with Armstrong (although he doesn't do any wave count nonsense). If I'm right about a sub'3... then we should just keep falling into late spring. So... its not the most exciting of opens..., but still... a turn/floor building day would be pretty natural. For the wave counters out there.... we do have a rather clear 5 waves lower, and in theory... we should battle upward from here... at least into the Friday close. 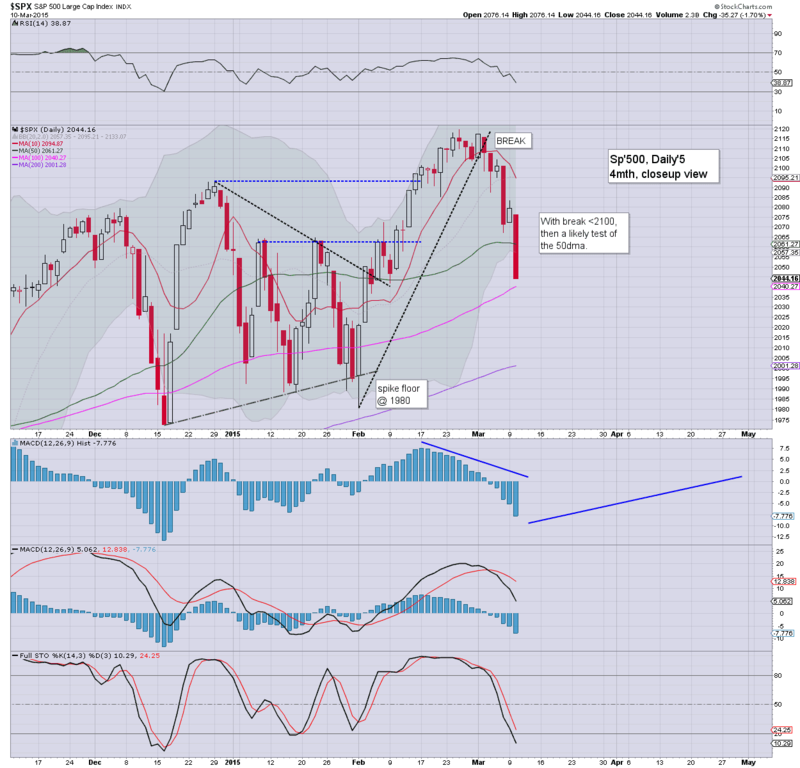 Indeed, a weekly close in the 2070//80s looks very viable. 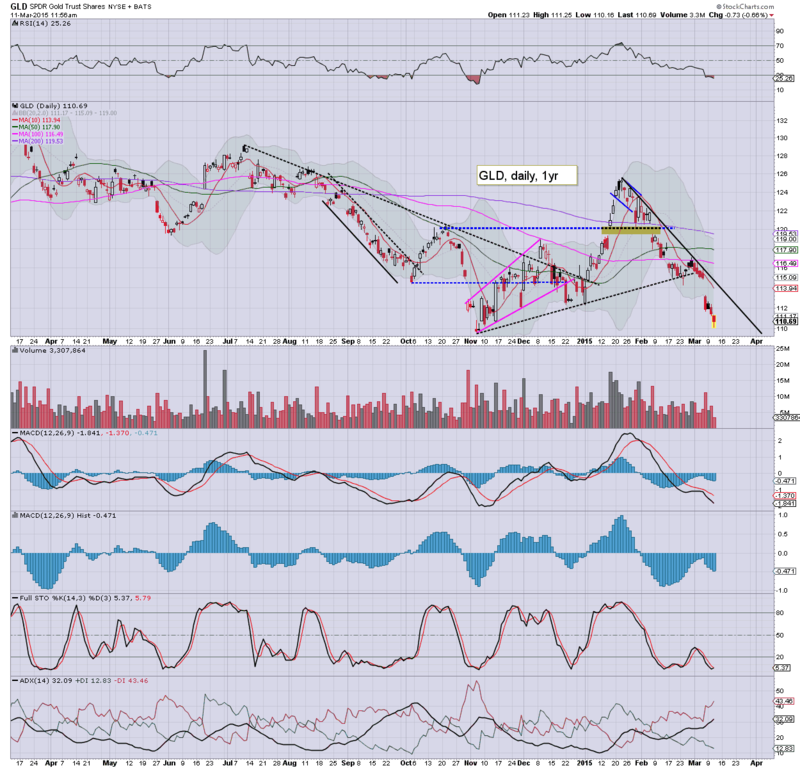 Notable strength: INTC +2.7%... on its way to the $40s.... just a case of how long it takes.... not if. 10.31am.. Oil inventories.. surplus of around 4 million barrels... not great.... but somewhat better. Oil still -1.6% on the day. 10.36am.. Fractional new index low sp'2043... Hmmm.... as ever.. VIX remains subdued... still stuck in the mid 16s. Good morning. Futures are on the rebound, sp +5pts, we're set to open at 2049. Metals remain weak, Gold -$2, whilst Oil -0.1%. King Dollar continues to soar... whilst the Euro slips to 1.05. So... we're set to open a little higher, but the bulls will need a daily close >2065 to break the down trend... that won't be easy. As ever... eyes on the VIX, it should remain firmly <17, and start melting lower... a close in the 15s would be useful to those looking for renewed equity upside. We're set to get a bullish MACD cross on the hourly cycle... late today or at the Thursday open. 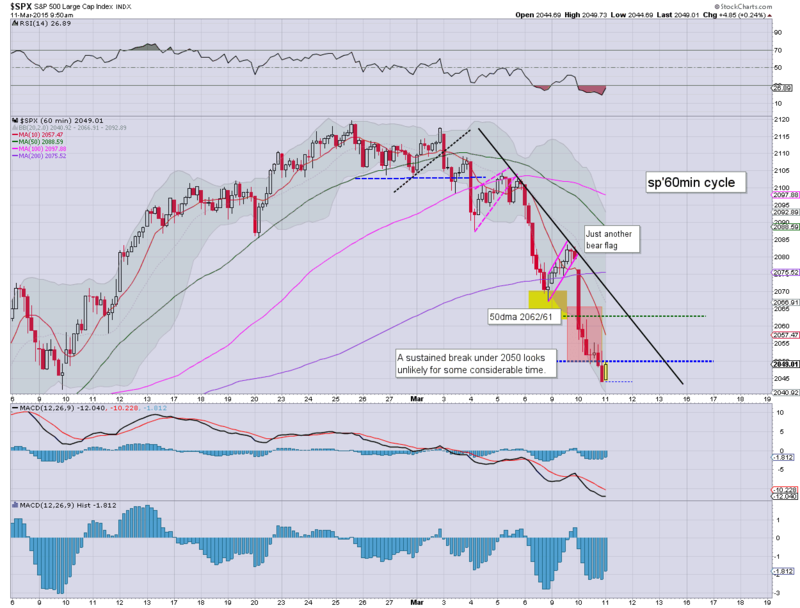 That should offer the sp'2070/80s by the Friday close. I don't think the ES will hit the 2020s in the near term... we've likely already floored. 9.40am. R2K, Nasdaq turn red... but so is the VIX. Overall.. lacklustre open for the bulls... but at the current rate, bulls still set to get a bullish hourly MACD turn BEFORE the end of today. 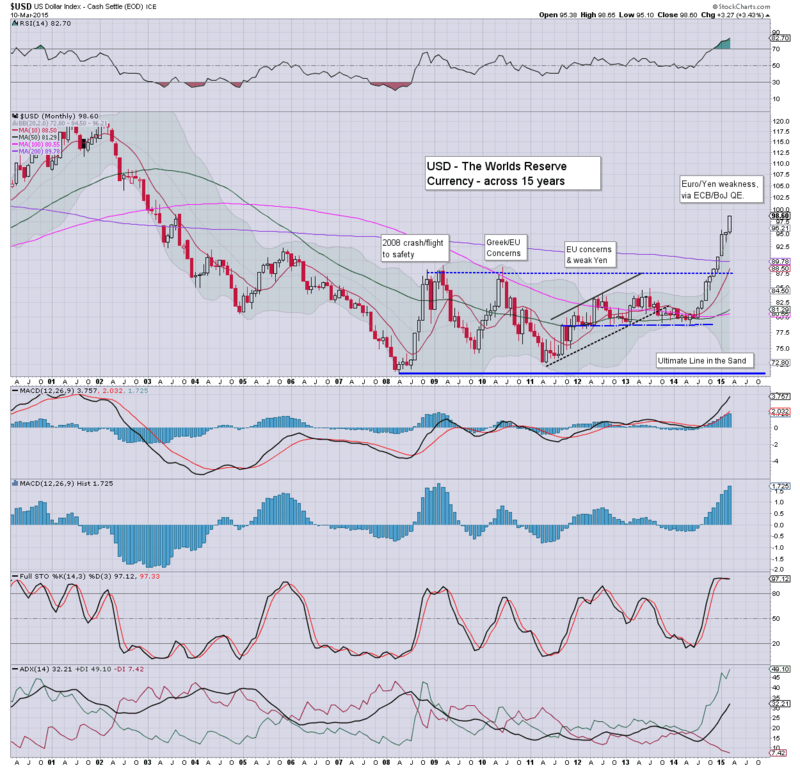 The Euro/$ settled the day -1.4% @ 1.0697... and this is causing increasing concern within the broader capital markets. €/$ parity - within the near term, would be a real problem for the equity bulls, opening up a test of the 200dma.. now @ sp'2001. *its late... and I'm tired... so this will be brief..
Euro looks vulnerable to a panic down cycle, if parity is lost against the USD... opening the door to the low 0.80s. Meanwhile, King $ grows stronger almost every day.. and the giant 100 DXY level approaches... from there... 120.. and eventually (given a year or two)... 160s. As for equities... with the daily close <2050 (a surprise to me), market is now vulnerable to further downside to the sp'2k threshold. 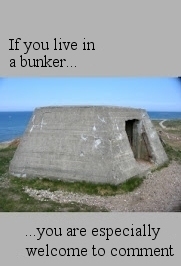 All things considered though... I'm guessing we see at least some degree of upside into the weekly close. A great deal will now depend upon how the market copes with Yellen next Wednesday afternoon. The only things of note scheduled for Wednesday are the EIA oil report.. along with US treasury budget data. US equities closed broadly weak, sp -35pts @ 2044, with a notable close under the 50dma of 2061. The two leaders - Trans/R2K, settled lower by -1.4% and -1.2% respectively. 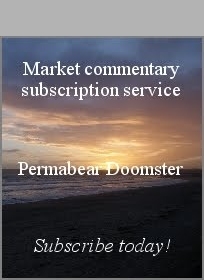 Near term outlook is offering a key floor... with renewed upside into next week's FOMC. 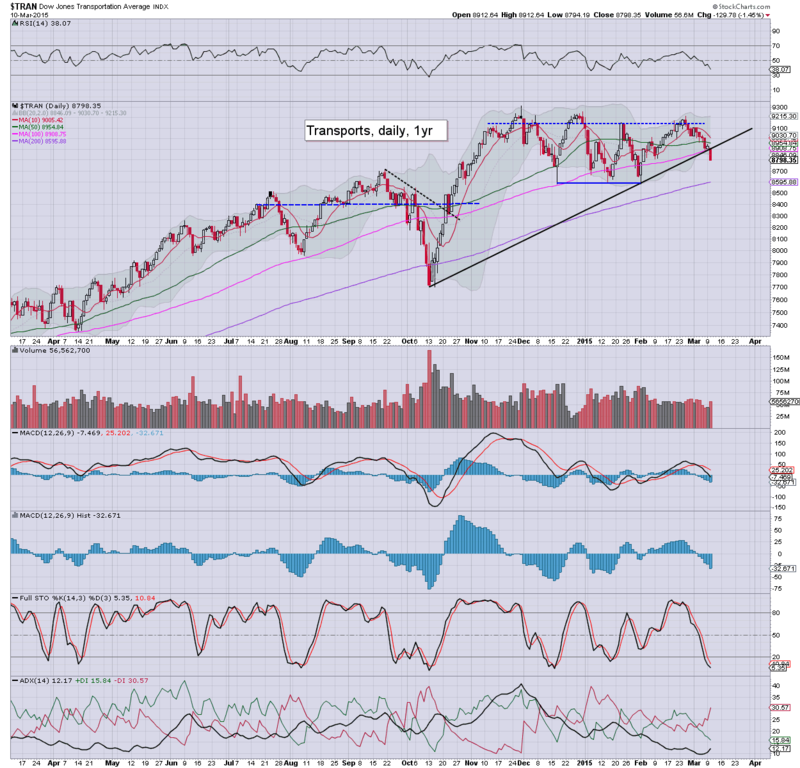 *Transports is the weakest index, and we have a clear break of the rising trend from last October. I had expected Tuesday weakness to the sp'2065/60 zone... the daily close under the 2050 threshold was something of a surprise. Perhaps most notable though, the VIX is not reflecting any particular concern in the market. In the immediate term, there is viable further downside to the 2030/20 zone.. but hourly cycles are offering a bullish MACD cross later tomorrow. On balance.. the situation favours the bulls into the weekly close.